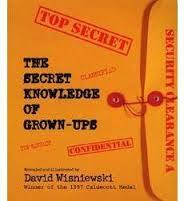 David Wisniewskil had the answers and in The Secret Knowledge of Grown-Ups, he let us in on the secrets. This imaginative gem reminds us why his 2002 death was such a loss—and how he can continue to inspire. The book spoofs all things conspiracy by revealing that none of the reasons parents give children for seemingly inexplicable rules are true. They are, Wisniewski confides, the result of a secret parental conspiracy to hide more sinister truths from children. Why eat your vegetables? The true reason, it seems, is humans need to keep vegetables under control. The best parts of the book are the detailed conspiratorial explanations. In the case of vegetables, apparently, millions of years ago meat-eating vegetables ruled the earth—saber toothed asparagus and wooly cucumbers. Only after the advent of fire did humans gain control, but if we don’t continue to eat our potential foes, who knows what might happen? Why drink milk? 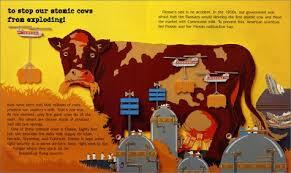 To keep atomic cows from exploding. Don’t jump on the bed—you might wake up the mattress. Aside from being glorious fun, The Secret Knowledge of Grown-Ups can both inspire imaginative writing and literary analysis. How about some of these? Of course, the most obvious extension is writing more rules—the ones Wisniewski would have shared had he been about to write another volume. Each rule, in Wisniewski style, would need to be supported by a detailed rationale and perhaps appropriate illustrations. The explanations themselves offer the chance to consider how authors present ideas and then support them with evidence. While the evidence presented here is obviously spoofed, it still could be used to practice identifying supporting evidence in text—or where it may be missing. Perhaps students can be sent in search of real-world evidence to contradict the claims the book makes (but I’ll admit, with this book, sticking to pseudo-evidence sounds like more fun). The Secret Knowledge of Grown-Ups can also be used to introduce the concept of spoofs. Check here to discuss the differences among spoof, parody, and satire and then think about other genres that have been (or can be) spoofed. Or, compare the book to actual presentations of conspiracy theories. Time magazine presents a handy list of common conspiracy theories, and a (teacher conducted, for safety’s sake) web search will surely turn up ready examples. I’m sure you’ll have even more ideas. I’d love to hear about them.